The service, which has featured in the Vietnamese market for five years, has begun to add more everyday services to its ride-hailing app. For instance, last June Grab Vietnam ventured into food delivery with GrabFood. Representatives said GrabFood has grown 23-fold in delivery orders and four times in merchant partners, making Vietnam the second-fastest growing market for GrabFood in the region. In addition, GrabExpress teamed up with e-commerce partners and individual sellers to deliver parcels straight to the doors of customers. GrabExpress has recorded a 241 per cent growth in parcel delivery orders. Last year, Grab also launched a strategic partnership with Vietnamese e-payment firm Moca, launching its first e-wallet system, GrabPay. Other services include micro-loans and insurance, also in collaboration with third-parties. Grab competitor Go-Viet, the Vietnamese subsidiary of Indonesia’s Go-Jek, has also joined the race. 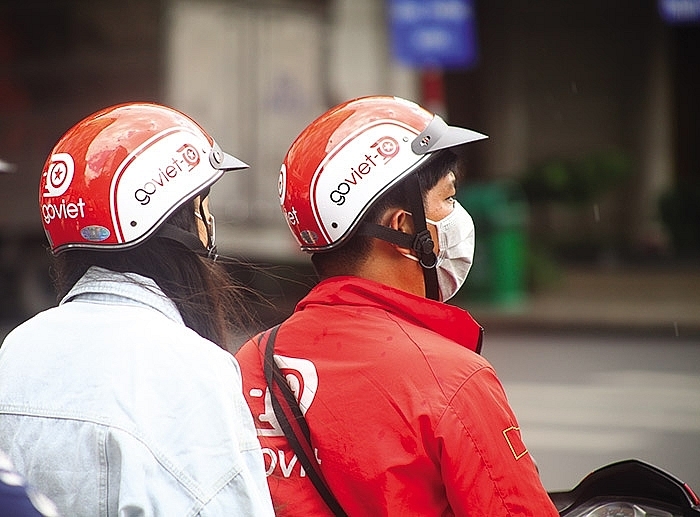 The firm currently offers motorbike hailing (Go-Bike), food delivery (Go-Food), and consumer-to-consumer delivery (Go-Send) in Vietnam. In the long term, Go-Viet aspires to offer various kinds of hailing services, as well as payment and e-commerce. This is similar to what its parent company Go-Jek is doing in Indonesia with 17 services in existence so far, from ticket purchases and grocery shopping to beauty services and car maintenance. Zalo, Vietnam’s most popular free messaging app, has also jumped on the bandwagon by integrating new functions including e-commerce platform Zalo Shop and payment platform Zalo Pay. The company, owned by VNG Corporation, has been piloting a long list of services from ordering food delivery and booking cabs to travel information and financial services. The platforms aim to become an indispensable part of everyday life for people. By harnessing the data generated by its users, app developers can gain more insights into their daily needs and behaviours, and use the information to offer new products and services. It is clear that the Southeast Asian developers are following the footsteps of Tencent and Alibaba in China. Tencent’s WeChat is the most popular mobile app in the country with over a billion monthly active users who chat, play games, shop, read news, pay for meals, and post their thoughts and pictures in one app. Similarly, e-commerce giant Alibaba has ventured into payments, micro-loans, insurance and more. Super-apps on the horizon are expected to bring tremendous benefits to both app developers and Vietnamese consumers. However, some tricky obstacles must be circumvented before these services can claim victory. For developers, a wide range of services will bring in extra cash and a diversified source of income. App providers also stand a good chance of making a greater impact on the everyday lives of consumers and targeting a broader range of potential users. Another bonus is the massive database of personal information and consumption habits that can be utilised for advertising. This is similar to social media firms like Facebook, who collect user data for advertisements. Dung Vu, senior account manager of Kantar Worldpanel Vietnam, said, “The daily transactional needs of consumers will be based on the Internet, which will benefit providers. In terms of payment, these super-apps promote the cashless economy by giving discounts on card or e-wallet payments.” This aligns well with the State Bank of Vietnam, which plans to turn Vietnam into a cashless country in the next decade. Another legislative plus is Vietnam’s warm embrace of Industry 4.0 in an attempt to propel the economy forward. For users, the advantages are also huge. Vietnamese consumers, due to their increasingly busy lifestyle, are now willing to pay more for services and products that offer them convenience, hence the rising popularity of 24/7 convenience stores, packaged foods, online shopping sites, and home delivery. As a result, a one-stop-shop app is likely to be welcomed by time-poor users, who can access multiple services such as ride hailing, food delivery, and messaging within one single application. Analysts believed that super-apps can transform the way business is conducted in Vietnam. Threatened by competition, traditional corporations, retail outlets, and fintech apps may choose to rise up against, or partner with, these app developers which will fuel either intense battles or cross-industry handshakes. New types of jobs, especially in the technological field, could be created as well. However, market observers have also voiced concerns. One problematic aspect is their legal status, especially evident in conditional sectors such as payment and peer-to-peer loans. In recent years, Grab has been embroiled in an ongoing feud against traditional taxi firms such as Vinasun and Mai Linh, and the conflict is likely to spread to other sectors if these multi-purpose apps continue to grow. Another issue, according to Vu from Kantar Worldpanel Vietnam, is protection of user privacy and data. If they are not careful, these apps may face the same backlash as Facebook, which was under fire throughout 2018 for mishandling user information. In Vietnam last year, major retailers such as Mobile World Corporation, Con Cung JSC, and FPT Corporation have also been accused of leaking thousands of customer card details. “Security and data protection are critical elements to success, and these need to be guaranteed,” said Matthaes from Infocus Mekong Research. He added that as they start to offer more services, super-apps should allow users to customise their own menus, as consumers do not want to be cluttered with services that they are not interested in. No matter what their future looks like, multi-purpose apps are likely to infiltrate everyday life, as well as media headlines, in the years ahead. These 4.0 providers, many backed by deep-pocketed investors, are most likely here to stay.